As a guitarist, Norman Tibbils performs in an amazingly wide range of styles including classical, jazz, and world music. Playing classical guitar, Norman has toured the U.S. with the Paul Winter Consort, and playing electric guitar appeared in the hit rock musical Rooms at Geva Theatre. Playing jazz, his full calendar of gigs as a solo guitarist keeps him very busy indeed. Returning to Rochester in the early 1980s, Norman’s schedule as a guitar teacher exploded, at one point topping 225 guitar students a week. A deeper study of music education at Eastman and at Nazareth College solidified his “ear-first” approach to teaching guitar. These days, Norman is busy teaching at Music&Arts in Pittsford, NY, where he has been praised by parents and students alike for his warm and engaging personality, wit, and candor. 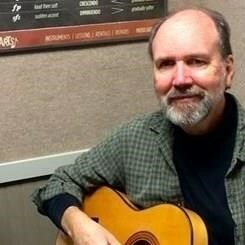 He spends virtually every waking minute practicing, arranging, writing, teaching, and performing music for his guitar students, and that’s just how he likes it. Request Lessons with Norman today!